Mommy This &That: Here I am! Yes, we are back from San Francisco and what a great time we both had just enjoying each other without the stress that is real life! The only complaint I had, was my poor feet!! Even in sneakers there was no appeasing them and half the time we were not even moving fast. Next time I'm getting some gellin' soles! Maybe it's just me, but I thought being pregnant and see others that were pregnant made you a member of some sort of club? Which would include a head nod, smile or something. I saw plenty of pregnant women and when I would look to them, ready to give a knowing glance, I got shotdown. I just assumed (see what happens when you do that?) that you would look at each other, look at your bellies and give some sort of smile, nod, wink? I thought pregnancy was some sort of sisterhood? Am I mistaken? 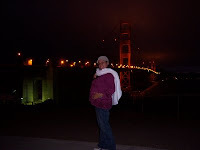 I took several pictures with me pointing out my belly...I'm hoping my lovely SIL will use them in her scrapbook. I have to say, I am so excited that she wants to do a scrapbook for us! I'd say it was because I don't have the time...but I'd be lying. It's just a relief to have someone that WANTS to do it, as opposed to me feeling like I SHOULD be doing it. Thanks Heather! And in new baby news, my particular friend, remember the one from a few posts back that sent me her dizzying BIRTH PLAN? She had her baby yesterday evening, after 13 hours of natural labor she admitted defeat and said birth plan was out the window and they had to do a c-section. Part of me wants to gloat...aw, heck, I will gloat! Why? Because ALL you ladies that chimed in on that post were RIGHT ON THE MONEY! So thank you for being honest with your comments and experiences...and keep them coming! But I also want to say congratulations to her and her husband, they tried for 4 years to finally hold their miracle and they finally are. Welcome Noah Samuel Benites! Nice pic, love the backdrop. Nope, no sacred sistahood among pregnant women. In fact, what is actually happening when they glance at you, is them checking out your belly and comparing it to their own to see who's belly is the smallest or looks the best. Yup, women are just as catty pregnant as they are when they're not. roflmao. I did natural childbirth with my first 2. I felt like such a champ. LOL But when we were expecting #3, from the get go I said "Medicate Me!!". I wonder why I ever did without. LOVE the PIC! OK HMMM sisterhood..
but just remember above all else that your body KNOWS what to do and it is the most natural thing in the world to give birth! Yes I will say it is painful and yes sometimes you may have to have a c-section but IT all will be OK! Trust ME on that and I can still say that with the fact that both my little ones were in NICU both times but it was all OK OK OK! Feel free to EMAIL anytime you have questions during your pregnancy. YES it is good to get advice from a person that is OUTSIDE your CIRCLE of FAMILY and CLOSE FRIENDS...just a different perspective. I made some GREAT freinds that way NOW! EPIDURAL - the happiest place on earth ;) At least it was for me! Glad you had a good trip. The only thing I can say is those pregnant women out there were clueless. Yes, there is some kind of unspoken sisterhood. I always looked at other mothers and smiled knowingly. I'm apologizing for them!